Last night’s dinner choice was a slam dunk! 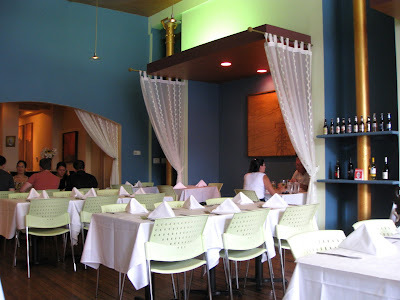 My friend, Jenny has been urging us to go to Lemongrass for some time now. She adores this place. And now I know why! It is absolutely awesome! I simply could not stop thinking about it all day today. Almost everything that passed these lips set me on a rant about the fabulousness of the tastes! And if “fabulousness” isn’t a word it should be … just to describe Lemongrass! O-M-G!!! Beginning with the space itself, I fell in love. From the outside on High Street it doesn’t look like much. There is a neon sign that’s kind of cool, but if you blink you might miss it. Don’t blink! Definitely don’t blink. The inside is just charming. I absolutely love the décor! The first course choices were all tempting. Bob chose to begin with the Eurasia Salad. 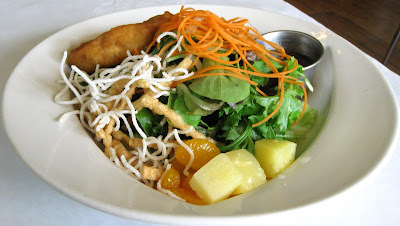 Baby field greens and romaine lettuce, roasted almonds, tangerines and crispy noodles; served with their Eurasia vinaigrette made with rosemary, maple, and spicy lime vinegar. It also had pineapple chunks and a funny looking fried thing. Can you see it there on the upper left side? Bob took a bite of it and looked at me with a big grin and said, “Oh, you’re going to love this.” I tasted it and he was right (as he so often is). He was darn lucky he got it back. I wanted it in a real bad way. The salad was delightful. The dressing was just perfect with the fruit and the greens. I chose the Pan Seared Veggie Dumplings. 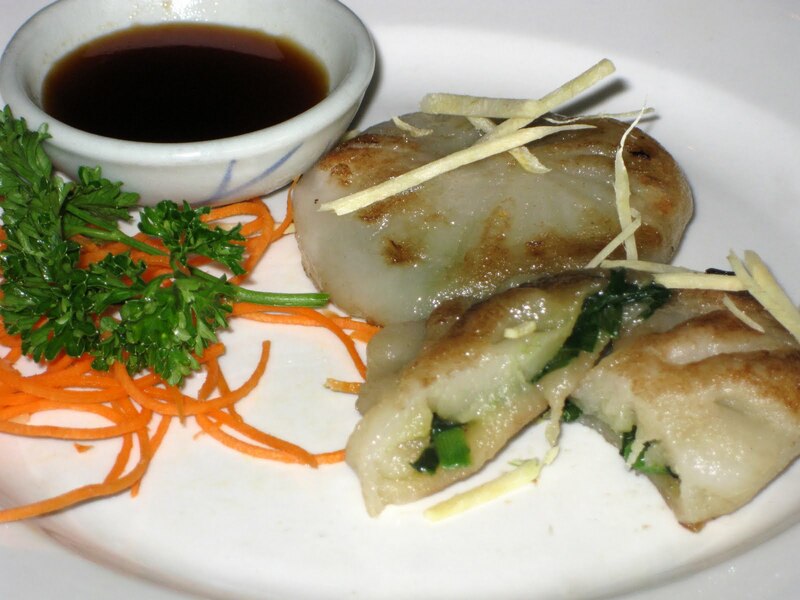 These are house-made dumplings stuffed with fresh Asian chives and served with their ginger-soy sauce. I love dumplings of any type so I barely even looked at the other choices. Um, let me say these were not quite what I had expected. The menu states they are “pan seared” so I anticipated that they would be like potstickers. These were more steamed than seared, and the texture was chewy. Don’t get me wrong, I ate them! The flavor was good, but the texture was kind of weird. 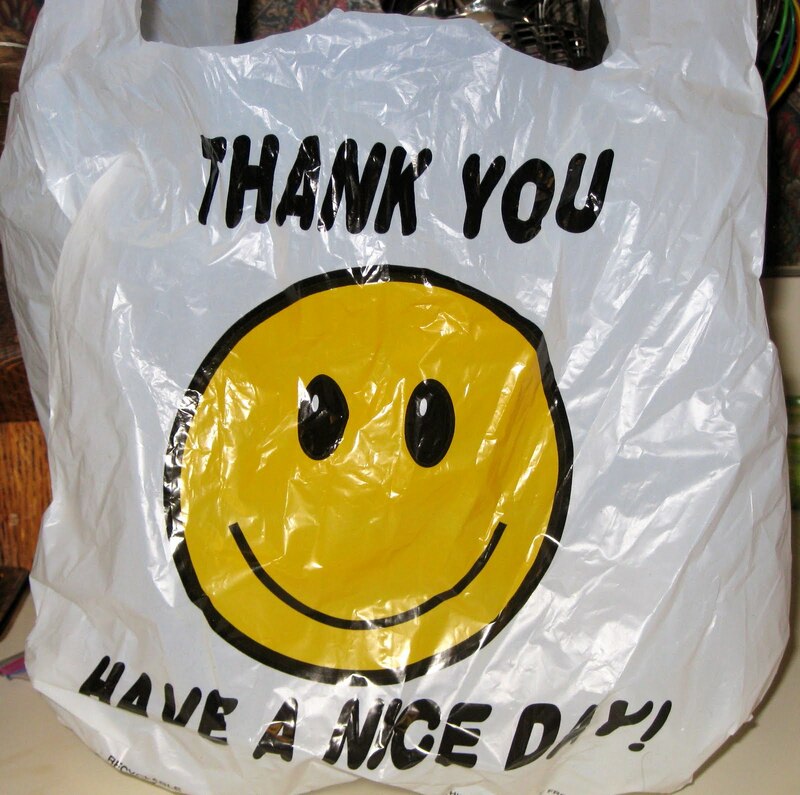 I probably wouldn’t order them again. But when talking to Jenny, she gushed over them. Go figure. The second course was served quickly after the first. Service was quick! Bob ordered the Pacific Rim Grilled Chicken. It is grilled then baked chicken breast, paired with their Pacific Rim cream sauce and served over linguine pasta. Oh my goodness is this good. 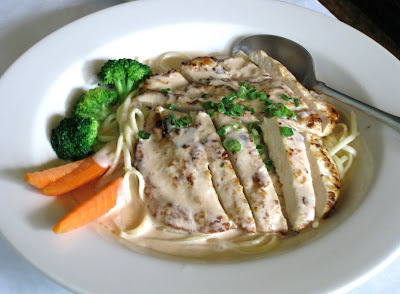 The cream sauce is just ridiculously delicious. The chicken was yummy, the linguine was cooked just right, and it was garnished with a couple of broccoli floweret’s and carrot sticks. The plate was gorgeous. I had the Monsoon Shrimp. 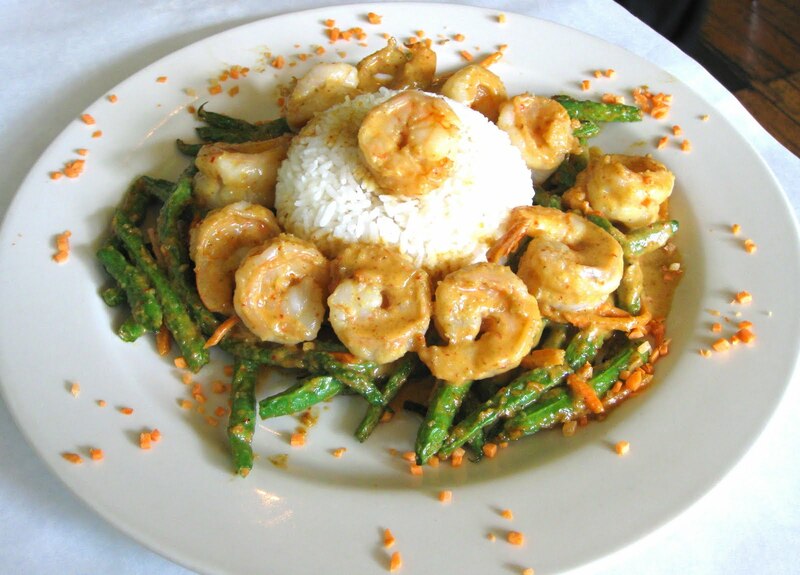 It is one half pound of fresh shrimp, wok-fried with lime juice, lemongrass, coconut milk, and chili paste. This is served over a bed of Thai green beans and steamed rice. I was a bit concerned that the dish might be too spicy for me because of the chili paste. (We all know what a wimp I am.) I asked our server and he assured me that it was not overly spicy at all. First of all, the plate was beautiful. The beans surrounded rice that had been unmolded in the center. 11 shrimp were then placed around the rice and one sat atop the rice. The sauce was indescribably good. We started eating our entrées and both of us were practically moaning. We switched plates and dug in. Neither of us could decide which was better. Bob asked if I wanted to switch back and I told him I wasn’t ready to. He responded, “Okay, but you’re losing shrimp at an alarming rate.” I took a few more bites of the chicken and linguine and reluctantly switched. My first bite of the Monsoon Shrimp had me swooning again. Who is the wizard in this kitchen? 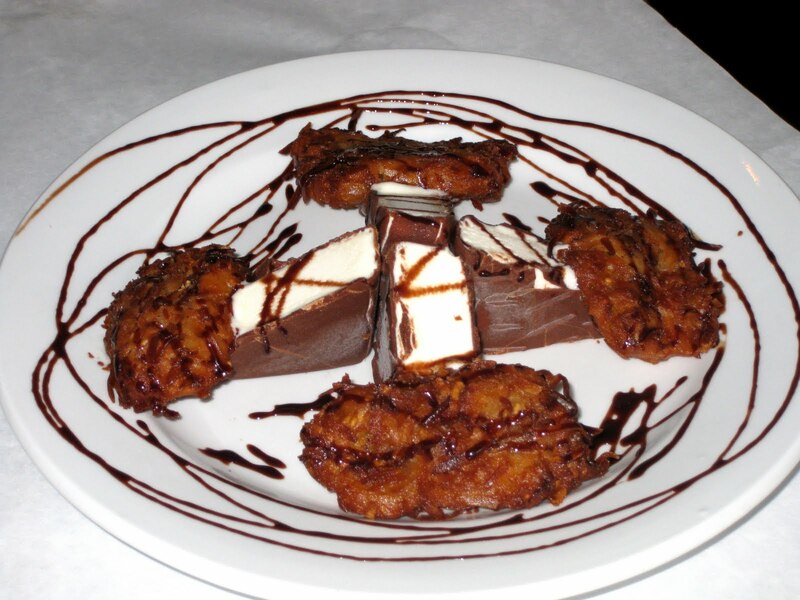 Our dessert dishes did not disappoint. What an incredible end to an incredible meal! 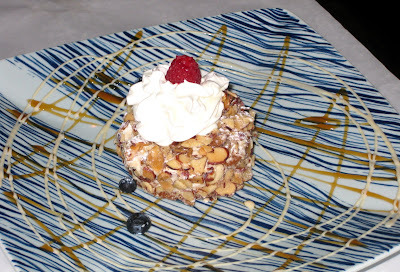 Bob got the Almond Cream Cake, which is a rum soaked almond pound cake, frosted with amaretto mascarpone, garnished with caramelized almonds and powdered sugar. Oh my goodness. This was so good and the plate was so pretty. I think Bob had half of it gone before I could even get a first bite! This was right up his alley. The rum soaked cake was moist and delicious. 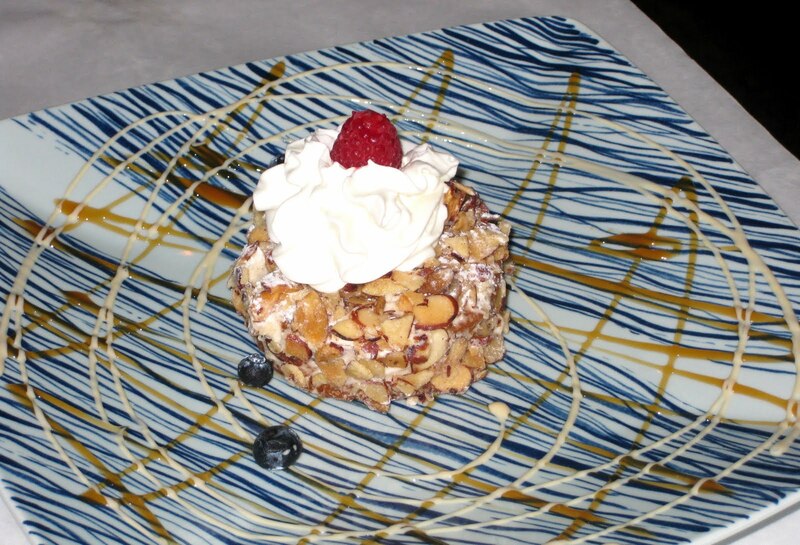 The amaretto mascarpone was the perfect complement to the cake. Yes, that was an excellent choice! My dessert was the Fried Plantains -- fresh plantains coated with coconut and sesame seeds, fried to a golden hue and served with chocolate covered ice cream bars. I loved this! Coating the plantains with coconut and sesame seeds was genius! The flavors were perfect together. Then to put the ice cream bars with the coconut/sesame plantains was whimsical. I wanted to lick the plate. To say that we will return to Lemongrass is an understatement. I’m already plotting my strategy for future visits. There are so many items I see on the menu that I want to try. Jenny and I have compared notes and I’ve received her recommendations. The possibility of a Lemongrass rendezvous with her looms large. They even packed our left-overs in a bag with a smiley face on it. What's not to like about this place? Maybe they should just permanently reserve a seat for me … one in the front room, please.